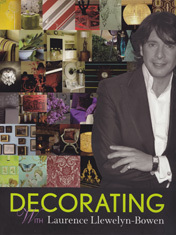 Laurence Llewelyn-Bowen recently launched his new book ‘Decorating with Laurence Llewelyn-Bowen‘ and our children’s products feature on p141/p142 under the heading of ‘Tidy up time’. It has some lovely images of our Letters and a Toy box. The information in the chapter really covers the considerations we feel are important when designing our products. Laurence stated that ‘Since grown up spaces quickly become colonised by children’s clutter, I had the idea of standing up against the tide of brightly coloured plastic by using cunning design to ensure that the living room can regain it’s grown up credentials after a 3 minute makeover’, more importantly I think that ‘Practicality doesn’t necessarily have to mean sacrificing design’.